We referred to Watford High Street as two different areas: on leaving the High Street Station, we would identify the road to the right of the station as ‘Lower High Street’, and to the left, ‘Upper High Street’. 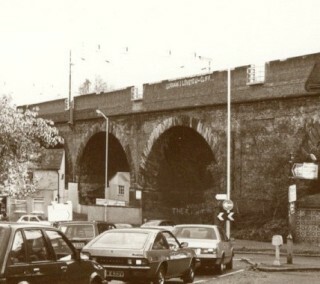 Lower High street started from Bushey Arches by one of the entrances to Oxhey Park, next to which was the ‘Wheatsheef’ pub. My memory starts from approximately 1941/2. There being many pubs in the High Street, I will not be referring to them in this section. Proceeding up the High Sreet, I can remember, and smell the Gas Works with their large gasometers, you could purchase coke very cheaply from the Gas Company, and you would see people with there sacks, barrows, and boxes on pushchairs, collecting coke. You could also purchase creosote in the same way, the difference being that you had to take an empty can for filling. Opposite the gas works was the London Green Bus Garage (Part of London Transport). These buses served Watford and the surrounding areas, the few red buses that were garaged their, were buses that operated between London & Watford Junction. Next to the Bus Garage was George Ausden the scrap merchant, though they collected all types of scrap, metal appeared to be the most popular, as you could see piles of it from the road. At this point I should mention that this area was noted for flooding. Further along was the Town Mission in Local Board Road (Now called The Pump House), I can remember carrying a wooden chair from their to Watford Field School, I was a pupil there at the time, our Headmaster Mr Coleman arranged to borrow the chairs from the Mission, for a sports function on the playing field, and I was amongst a group of boys sent to collect them. Another popular shop was Tividale Tools, noted for its large variety of tools. Then there was Fox Alley, a footpath (or perhaps at some time a cobbled road) between some very old cottages, which led to Watford Fields. Apart from the school, there was a Water Works, which belonged to Colne Valley Water Company. Across the road from Fox Alley was Dumbletons the Butchers, next to it was the old entrance to Sedgwickes Brewery, you could access the fields in Water Lane through this entrance, which was used by the stable lads, who led Benskins cart horses through this entrance to reach the grazing fields in Water Lane, after a days work pulling the Brewery delivery carts. There was Wren’s the Saddlery & Leather shop, Benskins Brewery & James, who marketed the Grain for Benskins, and then Weston’s the fish & chip shop. New Road opposite the station was noted for a green roofed house, and Gibson’s abattoir. I will end with Bushey Arches. Can anyone remember Luckett’s the Taxi Co. being situated under the second arch, and where did they go, after they were removed to enable a military concrete reinforced bunker to be built on their site. I will now endeavour to refresh my memory about the Upper High Street ! This page was added on 14/11/2013. All these bring back some memories to me. Like Barbara Birch, now live in Australia, as does Paul Donaghay’s brother, Peter. My grandfather, ” Jack” – Michael Wilson Osborne, lived at 26 York Road, Watford Fields. from about 1914. My parents, Jack and Winifred Osborne lived in Westfield Avenue, from 1938 to 1957. As a boy, I would travel with my father along Radlett Road and then along a footpath coming out on the High Street with a pub called the Leather Sellers at the junction. Then across to York Road. However, who remembers the Watford Fields area between the Fox and the Watford Fields Road? It was usually packed with loads of old Austin 7 cars owned or worked on by Bob Bramwell. Considered old bangers and junk then, they’d be worth a small fortune today. Grandad drank in most of the locals- the Swan, The Leather Sellers, the Anchor. He died when they closed the Fox as he’d always gone out before noon and ambled back at early afternoon closing time . Other memories of Lower High Street- the Gas Works where Grandad worked as a stoker for many years. The Spurlings the Vauxhall dealers and Allweather Motor Company. Later there was Glenn Motors, a Borgward dealer? Owner lived in Grange Road, Bushey. Oh well, a long time ago, but somehow a lot of things seemed better then. Perhaps it was the cross bar ride on Dad’s bike along side the River Colne that seemed exciting. Luckily, I never fell off, but a chap called Reg Sherrin did go over the small wall and into the river once. The fine for getting caught riding on the footpath was tow pounds! In the early 1960s I played in a group called The Ricochets. We used to practice in a large room above the Three Tuns pub. Possibly Lucketts moved to King Street, near theEssoldo Cinema. I lived in Oxhey Ave and Aldenham Road late 50s early 60s and remember Lucketts taxis under the Arches as late as 1967 but no idea where they went. I worked at a Vauxhall car dealership,with workshops and petrol bowsers in lower high street, it was opposite the gas works,early 1960s, on one side was a pub,name ? and the other a little cafe ,the ladies name was marge, she maid the best fried egg sandwiches i have ever tasted.i have lived in australia for 42 years, these watford memories are very clear to me. Dont expect there is much left of the lower high street i knew. Sedgwicks Brewery steam fire engine is owned by a man in Harpenden. the new fire station is built on the site & the museum is in the yard where there is still some setts in the ground from the brewery.